Looking to know more about the adidas Ultra Boost vs Pure Boost? Search no more. As the brand churns out hot seller after hot seller, we take a step back and compare two of the most OG Boost pieces of this successful run; adidas Ultra Boost vs Pure Boost. It’s worth looking back on the origins of each model for some simple reasons. After all, these two sneakers represent where the current craze originally started. Not so long ago, adidas made a calculated bet on a market trend that seems only to be growing. In a world where there is not (yet), the Pure Ultra Boost, real choices have to be made. Are Ultra Boost Good Running Shoes? Nike remains a dominant force in the world of sneakers today. If you can imagine it, things are even worse for adidas just a few years ago. Despite their strong endorsement signings, the Swoosh overshadows them. Boost sneakers are a miracle for adidas. Oddly enough, the technology is in the brand’s cross-hairs for a long time. Specifically, the first time the brand sees this tech is back in 2007. A German company named BASF blows away the athletic wear giant with their innovative new foam material. adidas designers saw this and are quickly brainstorming ideas. They decide to “revolutionize the running industry.” From that point on, it’s smooth sailing. The Pure Boost is an innovative marvel. The Ultra Boost is a quick sneaker community fascination – even worn by high profile celebs. 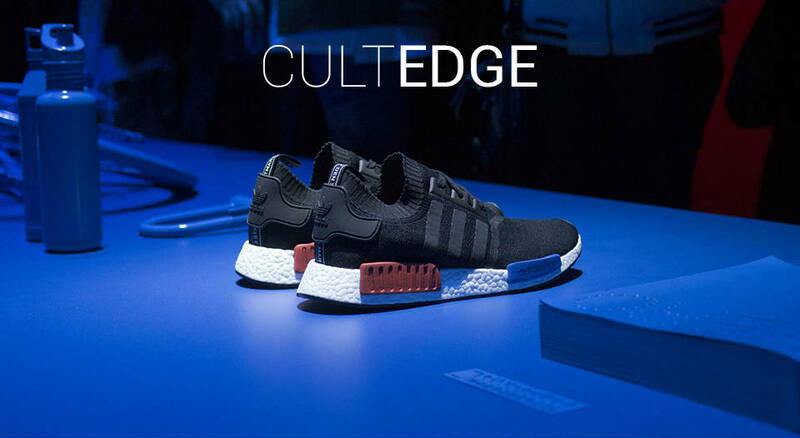 The NMD inspires lightning quick sell-outs and long lines. The Yeezy line absolute explodes. The list of benefits just goes on and on. In between those original decisions and the boom we currently witness every other day, the brand continues a rich tradition of innovation and business savvy. Looking back at that history, it’s easy to see the foundations of the Three Stripes’ success story. More importantly, it lends us some speculative tools to understand what the future holds. Both the Pure Boosts and Ultra Boosts stand at the very top of the brand’s running tree. Much of the background of this advanced running design is rooted in a simple notion and the backing of not-so-simple technology. The history of both begins with the company finding itself in the midst of an industry collision. All of a sudden, sneakers and high fashion were no longer separate entities. Before we even delve into the adidas Ultra Boost vs Pure Boost question, some context is in order. That shift in both industries is in between the respective releases of these two shoes. The Pure Boost is something of an upgrade on the original runner. Back in 2013, adidas looks to claim a strong grip on the running market by dropping the Energy Boost. For the larger public, this is the first time the innovative tech is introduced for consumer use, and it debuts well. Though a few running publications are skeptical at first, the reception to the Energy is largely positive. Fast forward to early 2014, and the Pure Boost debuts. In every conceivable way, this release is an upgrade to its predecessor. The functional tooling additions include stronger support. Impact protection is now beastly, with the Pure sporting a full-length Boost midsole. The directional webbing allows for an increase in flexibility. All of these upgrades are so the shoe, in the words of Global Running Design Director, Stephen Dobson, “moves with [runners] through the obstacle course of the city.” The brand studied runners in urban areas and put together a shoe to answer nearly every concern. 2014 is a year that adidas might want to forget. At this point, they are far behind rivals Nike. In fact, they seem to spend the years before then barely saying in the wider sneaker conversations. Well, not all of that year is bad. 2014 is also the year when the brand’s fortunes change for the better. In May of that year, adidas drops the Pure Boost. The technology had been available for quite some time. The Three Stripes brand just kept it for their running category. 2014 is the time it unleashes the ultimate sole technology via this innovative shoe. The whole sole sits in the cushy material. For the first time, a functional runner from adidas is deemed street-ready. It’s so inspiring that Yohji Yamamoto (and Y-3) himself picks it up and makes his own spin on it. Calling it Yohji Boost, he throws on sections of suede and premium lacing. The OG Pure Boost 1 looks less remarkable than its more recent version. And yet, it maintains its significance. This shoe represents a turning point for a brand that faced some truly trying times. Thanks to this unique shoe, adidas was back on the map. The Ultra Boost comes to us right around the time when adidas picks up on the “athleisure” trend. In 2015, it’s pretty hard to ignore it all. The hype around models such as the Stan Smith and Superstar saw retro models re-purposed as accessories to high-fashion ensembles. At the same time, streetwear solidifies its spot in the industry as more than a counterculture branch, moving onto runways all over the world. The Three Stripes brand was not about to watch this all pass them by. In a prime position to take advantage, they release the Ultra Boost, the result of intense research work. By this time, adidas is two years into experimenting with the tech on performance sneakers. A few years ago, this would have seemed like a crazy question to ask. How could they not be good running shoes? The Ultra Boost is the result of meticulous research and considerate design. In the wake of an industry-wide trend that blends sport with fashion, the Ultra Boost is perhaps the best possible response from a brand. But, the question remains, and it warrants addressing. The simple truth behind this is that it really isn’t so straightforward to answer. From a technical standpoint, both the Ultra and the Pure share solid foundations. So, what is the difference between Pure Boost and Ultra Boost? In a general sense, the design philosophy centers around flexible uppers and shock absorbent midsoles. Combining these sees the brand leads the way in the running market for the last few years. Yet, the concerns are understandable. They also complicate the Ultra Boost vs Pure Boost argument. The whole appeal behind Boost cushioning technology is in its promise to give runners an “energy return.” Fundamentally, what this means is that the energy put into each stride and impact with the ground is returned to the muscles and joints leading up to your knee – and a bit of your quadriceps – to feel a bounce to your step. This essentially helps a runner feel like their steps are lighter. The issue is the notion of joints and muscles feeling that much impact. Complicating the decision between the adidas Ultra Boost vs Pure Boost is some history. The traditional running sneaker finishes with EVA. Even with exceptions such as the GEL system from ASICS sport a synthetic casing. This helps to distribute impact from heavy strides rather than deliver it to your joints. The Pure Boost and Ultra Boost both have a build that sees minimal to no casing or separation between the footbed and cushion. The lack of that middleman means that soft layer is all that is standing between you and the impact of strides. The idea then that this layer is meant to send your force back up along your joints could make for some long-term damage. That being said, the reviews are mixed in this case. Most runners cannot get enough of their Boost tech and would love more of it, but there are enough dissenters to warrant this little bit of advice: know your run. You need to be aware of what makes for appropriate impact protection for your particular build and stride. From there, you’ll know if you need the latest and greatest in cushy tech or if a clunker from the 80s would be more your speed. This one is easier to tackle. Most of the Pure Boost and Ultra Boost models you come across boast a Primeknit upper. This design decision lends not only to breathability to each shoe’s stretch factor as well. Consequently, the woven uppers have a habit of conforming to your unique foot shape. Thus, it makes sense to go to your exact sizing on these models. For those of us with wider feet, you’ll definitely want to try these on before buying them. For the rest of us, just stick to your normal sizing and let the Primeknit do the rest. The history behind each of these shoes is one of innovation and science resulting in superior products. adidas has always been one of the more successful names in the industry, rising to astronomical heights. The fact we even have an adidas Ultra Boost vs Pure Boost argument at all is a sign of the brand’s good fortunes as of late. In fact, both of these shoes have very little int he way of direct competition other than with each other. The Pure Boost is an exceptional running model. Its latest rendition sees a stylish upgrade, rivaling the looks of the Ultra Boost. But, at its very core, this a performance model that goes crazy on the cushioning. That may be the make or break point for this shoe. If you’re looking for a sneaker that goes extra on the impact protection and offers feathery strides, the Pure Boost is for you. Sure, there have been some concerns about impact protection and joint pain, but that sort of thing will vary from person to person. The Ultra Boost sports much of the same functional features. The stride-by-stride energy return is actually fairly impressive on this shoe, with the addition of a more stylish frame. From a cultural standpoint, the Ultra Boost also presents just a bit more significance. It was a Triple White version of this shoe, in particular, that was making the rounds through social media newsfeeds when Kanye West gave it his approval. All in all, it’s an excellent shoe both for runners and those looking for the look that swept 2015-2017 under its hype machine. With both Boosts models crushing release after release, it’s hard to go wrong. While we’re on the subject of Boost sneakers, let’s diversify a bit. The Pure Boost vs. Ultra Boost question is hard enough to answer. The choice between the NMD and Pure Boost may be a bit tougher. Both shoes come with a similar ethos. The uppers are light and there’s plenty of Boost underfoot. The silhouette of each shoe is also low-cut. Still, there are some notable differences. The adidas NMD runs true to size for the most part. All this means is you can safely opt for your usual size. In contrast, the Pure model goes a bit wider. Specifically, the extra space is at the forefoot area. Now, it’s hardly reasonable to go a full size up because of this. But, it might be a good idea to try on a pair of Pure Boost before copping. Another note that is worth keeping in mind involves the uppers on these models. The NMD can often show up in a mix of materials. The most common iterations will be in a mesh base. On the other hand, standard Pure uppers are always in a knit build. Usually, it’s adidas’s signature Primeknit material. Choosing between these two comes down to personal preference. For a functional runner, the Pure Boost is the way to go. For something more casual, go with the NMD. To put it mildly, adidas is looking at a future of more bangers. This discussion even continues even further. With every passing few months, we see something new done to the several runners in adidas’s strong catalog. This could very well turn into an argument between Yeezy vs NMD. Each of those comparisons centers around a single, impressive theme: adidas is looking at a runners category where it may be its only source of real competition. Furthermore, the development of both of these runners leads one to wonder about the future of Boost technology. We see it on the basketball court and, more recently, on NFL football fields. Every year brings us continual upgrades to the execution of the Boost cushioning system. Heck, even Derrick Rose‘s line of signatures lives on. One can imagine that adidas has even more data than it did back in 2013 and vast amounts of motion capture tech to pair it up with. Long story short, the future of Boost looks very bright. One thing that this cushioning technology has done within the brand itself deeply affects the overall design process of many Three Stripes runners. When it’s still brand new and in development, Boost is something to play and experiment with. It’s the ignition to a self-sustaining sneaker trend that needs to develop into something. Now, with the brand’s designers carrying years of data and experience under their collective belt, it’s all about adjustments. In fact, Dobson even admits that Boost changes how they approach the design of almost every adidas footwear project. In the particular case of runners, the Three Stripes brand has to make a ton of adjustments. Even though each has the same goals, the adidas Ultra Boost vs Pure Boost discussion became about tweaking designs. The Pure Boost starts things off by allowing that hefty midsole some serious freedom. In fact, it’s possible that adidas designers decided not to go with any caging on the midsole because nothing could functionally hold all of that Boost in. Nonetheless, the shoe starts with very little in the way of containment systems or torsional support. It’s almost as if 80% of this sneaker’s goal is to help you feel bouncier when you go on runs. Moving on to the Ultra Boost, the adjustments seem minimal but pack quite a punch. Though the midsole is serious business, it’s quite a ways less than that of the Pure Boost. At the same time, adidas opts to leave the midsole unrestricted. In an almost literal way, you were running pillows. The introduction of lateral support elements is also new, providing some more help in terms of a 1-to-1 fit for the Ultra Boost. At the heart of every one of those changes is the cushioning setup. Not a single design adjustment could be made without considering all the Boost. That could also very well be how adidas continues their unbelievable run. From the OG drop to dipping it in color schemes, it’s easy to see the part that those Boost midsoles play in the Three Stripes’ success. adidas’s heads might be in the clouds at the moment, but as long as those clouds are balls of Boost, things should be alright for the brand. Shouts to our friends over at Sneaker Freaker and HYPEBEAST for the imagery.